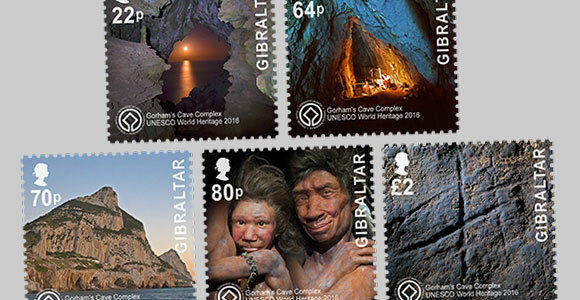 Gibraltar’s Gorham’s Cave has been granted World Heritage status. To mark such an achievement we are pleased to issue a set of 5 commemorative stamps which has been developed in very close cooperation with the The Gibraltar Museum. Gorham's Cave is a natural sea cave in Gibraltar, considered to be one of the last known habitations of the Neanderthals in Europe. Gorham's Cave gives its name to the Gorham's Cave complex, which is a combination of four distinct caves of such importance that they are combined into a UNESCO World Heritage Site. The three other caves are Vanguard Cave, Hyaena Cave, and Bennett's Cave. It is located on the south-eastern face of the Rock of Gibraltar. When first inhabited some 55 thousand years ago, it would have been approximately 5 kilometres from the shore, but, due to changes in sea level, it is now only a few metres from the Mediterranean Sea.